(Bridgeport, Conn. – March 5, 2014) – The Bridgeport Bluefish today announced they will be hosting a Bluefish Madness event on Thursday, March 20 to support Hall Neighborhood House. The event will take place at the Bridgeport Holiday Inn from 11:30 am to 3:00 pm. Individual tickets for the event may be purchased at $35, with proceeds benefitting Hall Neighborhood House. This includes an invitation to the event, where you can watch the first set of NCAA tournament games, along with food and a scratch-off game card. 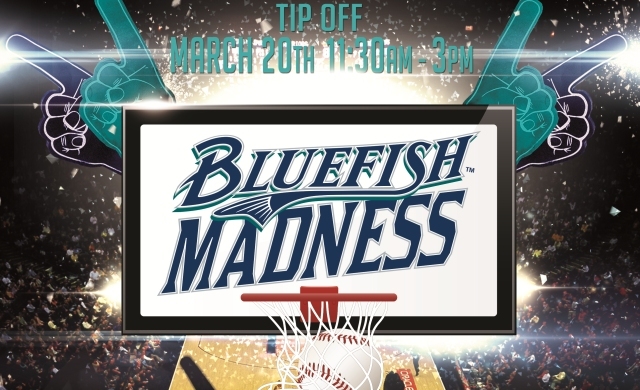 In addition, all guests will be able to test out their basketball skills on the Bluefish Madness hoop and also participate in a bracket-style silent auction with the opportunity to become Bluefish Manager for a day. This will be a drop-in style event, with all guests having the opportunity to attend anytime between 11:30 am and 3:00 pm. For more information on reserving tickets, please CLICK HERE, contact the Bluefish at 203-210-BLUE or email tickets@bridgeportbluefish.com. Hall Neighborhood House provides a host of social and educational programs that benefit the lives of children, youth, families and senior citizens. Besides their child care preschool educational programs, Hall provides services and support through their Youth Services program, the Hall Arts Academy (HAA) and the Ella Jackson Senior Citizen Center. Their mission is to provide services that enrich and empower the lives of families, children and individuals in Bridgeport and the surrounding communities. Visit their website at http://www.hnhonline.org.